Too many cooks often spoil the broth, but as the San Francisco/Salt Lake City/Berlin collective The Oyster Pirates prove, you can never put too much on your plate. Made up of seven artists—James Lichnovsky, Joel Mejia, Michael Page, Christian Rothenhagen, Shawn Webber, Jason Wheatley and Sri Zeno Whipple—this collective shows its pop-surrealist, deep-sea-meets-the-circus psycho-scapes to audiences from the U.S. West Coast to Europe. And, this lucky month, in our very own Salt Lake City. Opening night at Kayo Gallery was as lively as the work, wrought with creatures, ladies, tendrils and chaos. The buzz the paintings created was certainly warranted. Considering most of the larger pieces were painted by multiple artists, they are, despite the compositional hysteria, amazingly cohesive. The craft, if locally familiar participants Whipple and Wheatley are any pre-conceived indication, is incredible. (Detail from “The Ascension of Madame Wong,” by Whipple, Wheatley and Webber, is pictured.) The glazing, paint quality and show as a whole teems with a peculiar magic and mastery all its own. 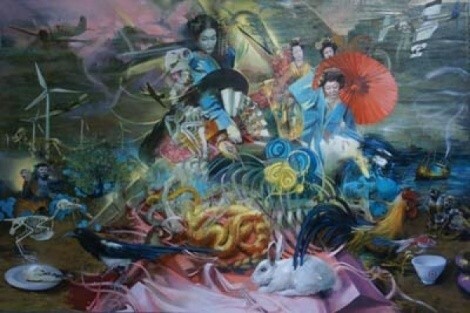 Although most works are collaborations, the exhibition is also peppered with solo paintings, which serve as little stylistic reference points against the complete blended stew of octopuses, stripes, frogs, flamingos and mystical Asian women. This way you can get a small sense of what each artist contributes to the whirlwind of imagery. The common thread among them (other than phthalo blue) seems to be that fantastical, exquisite sense of chaos. Brave the gale and steal a glance; the pearl is worth a plunder.